Cornhusker Bank congratulates the members of its mortgage team recently recognized for the second consecutive year by the Nebraska Mortgage Association (NMA) as members of the 2016 Champions Circle. Mortgage Loan Originators, Mike Barrett, Andrew Essay, Matt Gutschenritter and Luke Mitchell were recognized at the NMA luncheon in Omaha on Sept. 22nd. This recognition celebrates and honors the dedication and hard work mortgage professionals put into serving their clients during the home loan process. Benchmarks for being recognized include origination of either 100 loans or $12 Million in volume in the previous 12 month period. 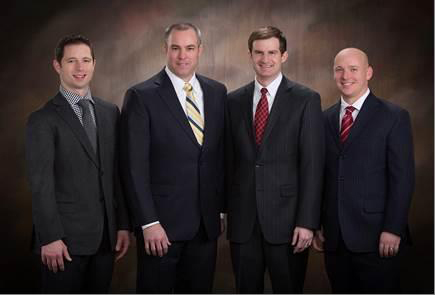 All four mortgage originators from Cornhusker Bank exceeded both benchmarks. Cornhusker Bank remains Lincoln’s oldest locally owned bank, demonstrating hometown heart, stability, soundness and continued commitment to the success of its valued customers and associates. It’s a sad reality: when military personnel are away for long periods, criminals often target their identities. Compared to the rest of consumers, military personnel experience, “28 percent higher rates of new-account fraud and 18 percent higher rates of familiar fraud,” according to Javelin Strategy & Research. New account fraud happens when someone obtains new credit using your personal information. And familiar fraud is when someone you know, such as a friend, fellow service member or family member uses your information for personal gain. • Place an active duty alert—Adding an active duty alert to your credit files indicates that businesses need to be extra careful about verifying your identity before granting credit in your name. • Review your credit report—Understanding where your credit stands before you leave will make it much easier to spot fraud when you get back. Visit http://www.annualcreditreport.com for free copies of your current credit report. • Carefully consider your power of attorney (POA)—While you may need to assign a POA to handle personal or business affairs while you are deployed, use extreme caution because your POA is legally allowed to make decisions on your behalf for whatever is stipulated in the POA agreement. So ensure you can fully trust the person. And only give them power over things that cannot be left until you return. To find out how you can work with a fraud specialist to help manage and protect your identity, contact a personal banker.